Savor 21 stops at some of our state’s historic pits. 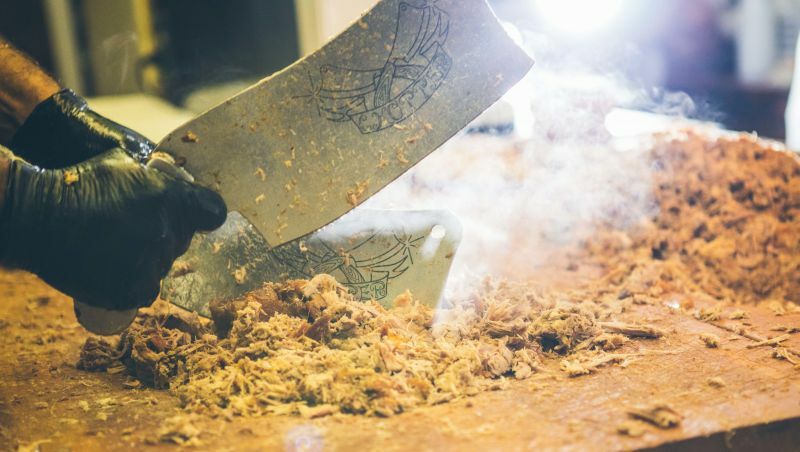 Starting in Ayden with famed Skylight Inn and finishing in Murphy with Herb’s Pit BBQ, the North Carolina Barbecue Society Historic Barbecue Trail spotlights 21 stops that specialize in roasting pig the old-fashioned way – slowly, over pits of wood or charcoal. Both distinct styles of barbecue, Eastern and Lexington, are represented on the trail and continue to cause heated debates along the way over which tastes better. Eastern-style ‘cue tends to be vinegar-based, while Western- or Lexington-style is generally more ketchup-based. And, yes, you’ll also see it spelled two ways: barbecue and barbeque – or often just ‘cue or Q. Whatever the style or spelling, you’ll find it still tastes great in the Tar Heel State at these select Trail members. 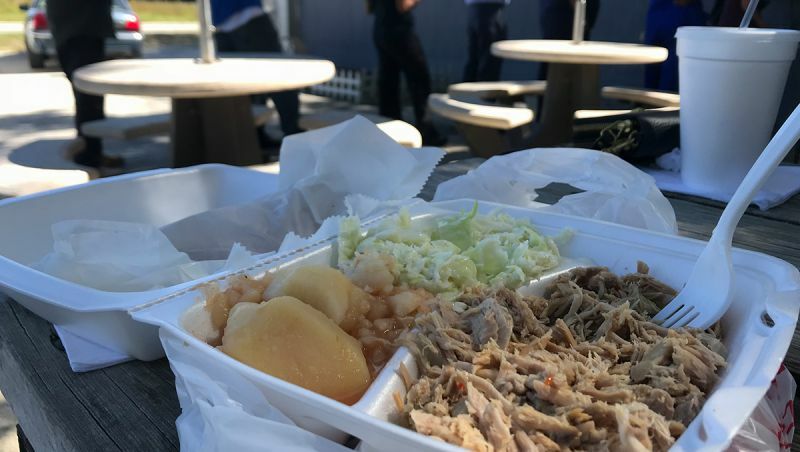 Founded in 1947, this small destination sells pork sandwiches with slaw and corn bread, plus sodas and iced tea. Just look for the replica of the Washington, D.C., capitol building on top of the Skylight Inn. 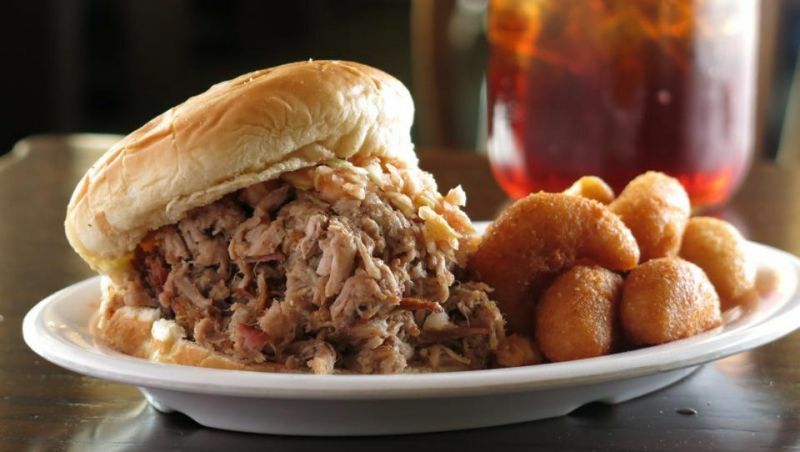 A full-service restaurant, Bum's serves breakfast, lunch and dinner, and is one of the only barbecue joints in eastern N.C. with a buffet table filled with freshly prepared vegetable sides such as black-eyed peas, collards and stewed rutabaga. The McLawhorn family owns and operates this classic ‘cue joint. They close for the day when they run out. Steve and Gerri Grady opened Grady's Barbecue on July 4, 1986. Their classic ‘cue and sauce have kept patrons quite patriotic about it ever since. Stephenson’s was founded by hog farmer Paul Stephenson back in 1958. His chopped barbecue and sauce have been popular ever since. Besides a variety of delicious sandwiches such as pulled pork, BBQ brisket and pulled BBQ chicken, try the jumbo smoked wings - the chicken is delivered daily from local farmers. The Pik-n-Pig also serves beer. The Hursey family has been cooking whole hogs for many decades and started selling to the public in 1960. Cooked in open pits over hickory and oak, Hursey’s barbecued pork is renowned for being perfectly moist and sauced. C. Warner Stamey started this Triad family tradition and grandson Chip carries it on at two locations. The smiling service, cole slaw, hushpuppies, sweet tea, and homemade cobbler are equally famous. Fuzzy’s features Western-style barbecue 7 days a week, except Easter, Thanksgiving and Christmas. Trays, plates, sandwiches and other ‘cue specialties are all on the menu. Joe Allen Hill, a Lexington native, started Hill’s Lexington BBQ in 1951, along with his wife, Edna. Look for Winston-Salem’s own Texas Pete Hot Sauce on the tables. Formerly Little Richard's, Richard Berrier's Real Q now has two popular Winston-Salem locations, including the original and classic Country Club Road location and a more modern outpost on Gumtree Road. BBQ sandwiches, trays and plates all come with Richard’s tangy secret sauce. With a variety of names and owners through the years, Smiley’s has been a Lexington landmark for more than six decades. Current owner Steve Yount has continued the tradition with a classic Lexington-style ‘cue experience. 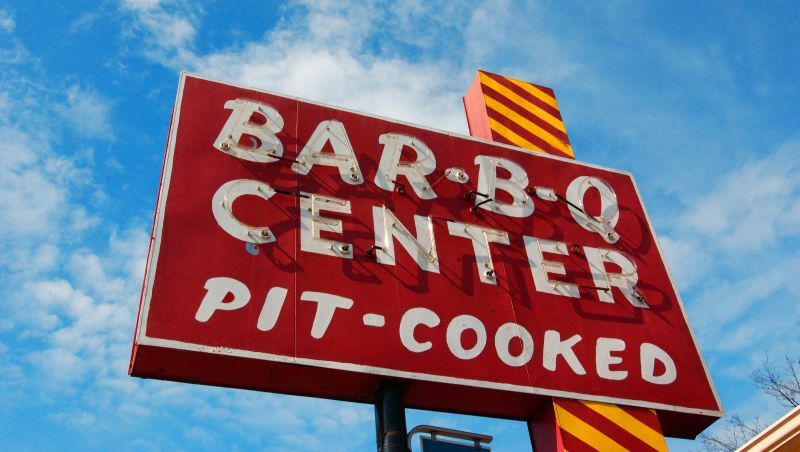 Known as Lexington’s oldest barbecue joint still cooking on pits, the ‘cue at the Bar-B-Q Center is custom-ordered, depending on your preference for browned bit, fat and more. There’s also curb service. Originally T&F Bar-B-Q, which opened way back in 1935, Richard’s Bar-B-Q is actually known for serving tasty Eastern-style ‘cue. 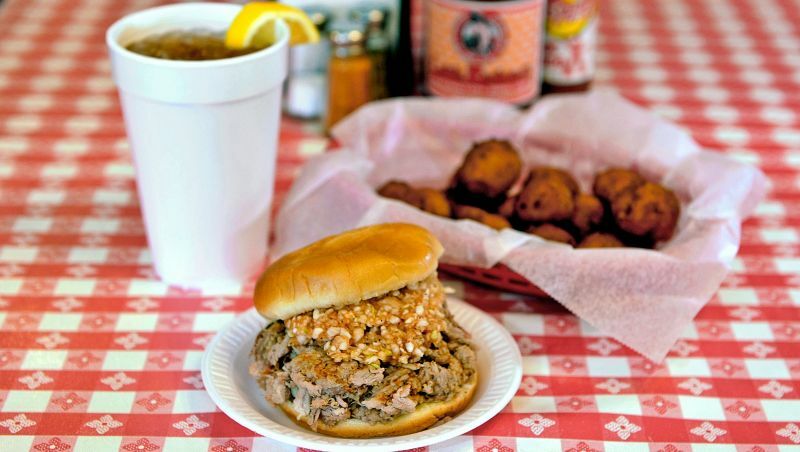 It remains a North Main Street classic for barbecue. Founded by Myron and Kathy Thomas in 1990, M&K features classic ‘cue and other country-style fare. Myron was once a long-distance truck driver and knows good ‘cue and country cooking. Owner Steve Abernethy has been serving pit-smoked barbecue, hand-pattied burgers and hand-breaded onion rings at Bar-B-Q King since 1971. Order at the counter, hear your order get hollered back to the cooks and enjoy your plate of food within minutes. Open seasonally from spring through fall, Switzerland Café has one of the largest wood-fired smokehouses in North Carolina. Try the Applewood-smoked trout – it’s a favorite among diners. A family-owned operation since 1946, this is a Shelby institution. The pork is cooked on cedar overnight and the “Barbecue Sause” is popular in-house and at home at Red Bridges Barbecue Lodge. Order your chicken, pork butts, ribs and brisket at the Hubba Hubba Smokehouse window, then grab a seat in the outdoor courtyard complete with picnic tables and gardens or in the fully enclosed room off the courtyard. Open since 1982, Herb’s is known as the only barbecue restaurant west of Asheville using open pit cooking. The pork is known for being smoky and the sauce sweet.